The work of the late Rabbi Shimon Gershon Rosenberg (Shagar) is far too little known in the Jewish world. He was a significant thinker who produced an unusual synthesis of Judaism and post modernism, developing a unique and fresh approach to spirituality. This…..is essential reading for those in search of a new and sensitive Jewish voice for our time. Rav Shagar was born in Jerusalem on 21 Cheshvan 5710 (November 13, 1949) to his parents, Reb Shalom Zelig and Sasi Rosenberg. Shortly afterwards his sister Edna was also born. His father was a carpenter and eventually established and managed a large carpentry. The family lived in various Jerusalem neighborhoods, Tel Arza, Mea Shearim, Kiryat Moshe and Bayit VeGan. His parents were Holocaust survivors from Transylvania [Rumania] and the Rav acknowledged that the Shoah was a major presence in his life.He studied in the Neve Etzion Elementary School in Bayit VeGan (1955-1963) and then at the Netiv Meir Yeshiva High School (1963-1968). He continued his Torah studies at the Kerem B’Yavneh Hesder Yeshiva (1968-1973), and in that framework he served in the army, at first as a paratrooper and then in the Tank Corps. During the winter semester of 5733 he studied at Yeshivat Mercaz HaRav Kook.At the same time he began to study with HaGaon Rav Shlomo Fischer shlita, as well as with several Kabalists.On 17 Adar Sheni 5733 (March 21, 1973) he married Miriam (Ziv) and over the years their children; Avishag, Shulamit, Yosef, Odiya, Ruchama and Yitzchak, were born. For thirteen years (1973-86) the family lived on Shmuel HaNavi Street. The Rav loved the open space that existed then around the house, as well as the proximity to the old religious neighborhoods of the Yishuv HaYashan. From there the family moved to their apartment in Kiryat Moshe.After his marriage, during the summer semester of 1973, The Rav began to study in the kolel of Yeshivat HaKotel. On Motzei Yom Kippur he was called up for service in the Yom Kippur War. On the next day, 11 Tishrei (October 7), during the battle at the quarry of Nafcha in the Golan Heights, the tank he was driving was hit by enemy fire. Two members of the crew, friends of his from yeshiva; Shmuel Orlan HY”D and Yeshiyahu Holtz HY”D, were killed. He himself remained wounded in the field until he was eventually evacuated. The war left deep scars that remained with the Rav for the rest of his life. After his recuperation (towards the end of November 1973) he returned to Yeshivat HaKotel. At the end of that year, the Rosh Yeshiva, HaRav Yeshiyahu Hadari, and the Rosh Kolel, HaRav Yaacov Katz, appointed him to serve as a ram in the Yeshiva. In the fall of 1975 he was ordained as a Rav. During the year of 1981-82 he replaced Rav Hadari as Rosh HaYeshiva. He continued to serve as a ram through the summer of 1984.In 1984 HaRav Adin Steinzaltz (Even-Yisrael) established the advanced yeshiva Mekor Chaim and invited the Rav to serve there as a ram. Along with him were other teachers including his friend HaRav Menachem Frumin (the Rav of the settlement of Tekoa). The Rav taught at Mekor Chaim through the summer of 1988.During 1988-89 he headed the Bet Midrash Maaleh of the Center for Religious Zionism, together with (Tanach scholar) HaRav Yoel Bin-Nun and Professor Shalom Rosenberg (currently Professor Emeritus of Jewish Thought at the Hebrew University). The Bet Midrash functioned for one year. In the fall of 1989 Professor Binyamin Ish Shalom established Bet Morasha. The Rav was appointed as Rosh Bet Midrash, along with Rav Eliyahu Blumensweig (currently Rosh Yeshiva of the Yerucham Hesder Yeshiva) and continued in that position through the summer of 1997.In the fall of 1996 he established Yeshivat Siach, heading it together with his friend HaRav Yair Dreifuss, until his death. In its first years the Yeshiva operated at the Himmelfarb High School in Bayit VeGan in Jerusalem. Eventually it moved to Givat HaDagan in Efrat, where it is located to this day. Its name was changed to Siach Yitzchak in memory of HaRav Dr. Yitzchak Breur z”l. The Rav’s father, Reb Shalom Zelig z”l died in the fall of 1995 and his mother, Sasi (Sophia) z”l died in the summer of 1999. In the early months of 2007 the Rav was diagnosed with a fatal illness that involved intense suffering. He moved with his wife to Moshav Givat Yeshiyahu near Emek HaEla, fulfilling a dream of many years. There, in the final months of his life, amidst the pastoral tranquility and quietude, the Rav devoted the remainder of his strength to introspection and cheshbon hanefesh. On Sunday evening, 25 Sivan 5767 (June 10, 2007) he was taken to his Eternal rest. In his life and learning the Rav strove for total religious truth. His entire life was dedicated to intense Tora study and Divine service – through learning, teaching and conversations with his students. He prayed daily at sunrise and his prayer was always marked with seriousness, intention and introspection. In addition to studying all aspects of the Tora; Shas v’Poskim, Rishonim v’Achronim, Halacha v’Agada, Kabala v’Chassidut, his studies branched out to various disciplines of secular wisdom; philosophy, psychology, anthropology, history, Talmudic research, Hebrew and world literature, science fiction, poetry and more. Towards the end of his life he articulated his position on spiritual combinations in the following words; the connecting ‘and’ (vav hachibur) which is so typical of Religious Zionism – yeshiva and army, yeshiva and academics, Tora and secular studies, Tora and work – is not an artificial synthesis…and should be understood…like the keystone at the top of an arch which holds the entire arch together and gives it significance. His broad horizons complemented and empowered his deep connection to Talmud study. He viewed the study and teaching of Gemara as his primary activity, and devoted most of his time and energy to it with unlimited devotion. My goal has always been not to be satisfied with mere intellectual understanding of the text, but to transform it into a real force in the lives of the students. My task is to find the appropriate ‘language’ in order to bring the words of Chazal and the Rishonim into our world…to find a method of study…that will wisely internalize traditional methods but will also understand how to open up to new methods, without damaging the traditional sense of Tora study as a covenant with HaKadosh Baruch Hu. The Rav was among the first people to introduce the study of Chassidut, in all of its varieties, Chabad, Breslov, Ishbitz, etc, into Zionistic yeshivot. Many view him as the spiritual father of the Eretz-Yisraeli Chassidic yeshivot (including Mekor Chaim, Tekoa and Otniel). His curiosity, honesty and willingness to make room for questioning and difficulties in all of their power, and without compromise, as well as his concrete addressing of general culture and philosophy and its truths, penetrated to the very depths. These, together with his integrity and modesty, his willingness to learn from everyone, his talent for listening, as well as his special grace and simplicity, combined together to make him a spiritual guide and a source of inspiration. His students were connected to him with heart and soul. He merited training many students who are continuing his path; activists in the intellectual world, in the realm of Israeli and Jewish issues, educators, artists and heads of institutions. Although his students have been affected by his spirit, his main Tora is still hidden. In the last decade of his life a few of his works were published, but they are but a tiny fraction of what his writings. The Rav left us with thousands of handwritten pages and computer files, filled with creative chidushim in all areas of the Tora. 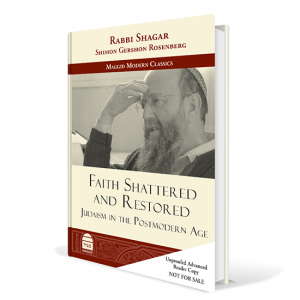 a new book in english: Faith Shattered and Restored – Essays on Judaism in the Postmodern Age. For details click here. Rav Shagar was a prolific writer. During his illness, he requested from his closest students, and from his family, to organize his writings. After his death they established "Alfay Shagar" – a non profit organisation, whose goal is to bring his request to light. This became an intellectual effort to probe the depths of his thinking by collecting his numerous writings into book form. Currently, "Alfay Shagar" has published 18 books and articles on various Jewish philosophical and religious topics that integrate Hassidic and traditional concepts into relevant meaning for the modern mind. The progress of "Alfay Shagar”'s activities is based and dependent on contributons, the selling of his books, and grants from various sources. 7. a dialogue between Rabbi Ari Ze’ev Schwartz and Levi Morrow about The Philosophy of Rav Shagar and His Spiritual Relevance: Facebook posts – part 1, 2, 3, 4, 5, and Live recordings.